...that NOBLE Team was originally composed of seven members? One of the door interlock towers within the Etran Harborage when locked (left) and unlocked (right). There were six door interlocks around the portal leading into the tunnel which connected the interior of the Etran Harborage to its outer surface. When engaged, each of the interlock towers projected a hard light door over the portal to prevent access to the tunnel underneath. The interlocks must be opened in pairs of opposing sides for the hard light to deactivate. There were control consoles at the base of each interlock tower, and, like other significant Forerunner technology, they could only be operated by a Reclaimer. During the Battle of the Etran Harborage in 2531, the door interlocks engaged in response to Flood and Covenant activity around the portal. UNSC detachment from the UNSC Spirit of Fire were deployed to establish firebases and eliminate both opposing forces. The mission was successful, allowing the UNSC Spirit of Fire to escape the shield world when John Forge sent the ship's Shaw-Fujikawa Translight Engine into the shield world's artificial sun. The resulting chain reaction resulted in a supernova state. The door interlock towers were destroyed in the shield world's ensuing destruction. 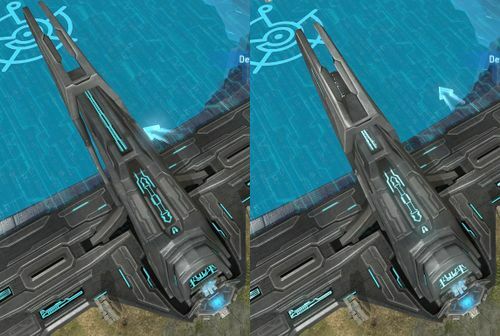 The door interlocks appears exclusively in the Halo Wars campaign level Escape, serving as the final level's main objectives. All three pairs of the door must be deactivated within the countdown timer to complete the level. Players need to deactivate the interlocks by accessing their control panels when a friendly unit is nearby. Each pair will only disengage when both interlocks are deactivated, and if a Covenant or Flood unit approaches a deactivated interlock when the other interlock of the pair is still active, the deactivated interlock will lock up again, necessitating the player to send a friendly unit to deactivate the interlock again. Activating the interlock towers in a counter-clockwise fashion will reward the player the "Thinkin' About My Doorbell" achievement.